My husband has been riding all of his life. Me, I had only ridden by myself once - and that was a barely avoided disaster. We quickly discovered that he had a hard time mounting the cycle with his disability, and we really didn't fit on it together very well anyways. See my husband stands 6'4" and is a large man, I also stand over 6' and am rather "big boned" myself. So we decided to "just look" at the used inventory. Man, they must have seen us coming. We ended up walking out with papers for 2 used HD's. 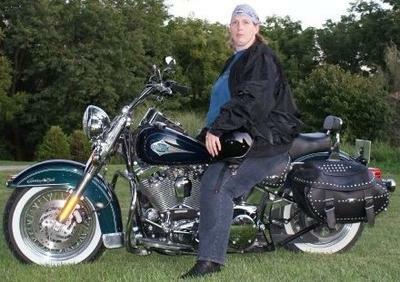 His is a 2005 Springer Softail - denim blue. Mine?? It's a 2001 emerald green Heritage Softail. The day they were delivered I couldn't wait to get on and ride. I got instructions from the hubby, and off I went, around to cul-de-sac at 5 mph...lol. I rode around, and around, and around until I was familiar with the gears and feel of the bike. My next challenge was the lake by our house. It has this great little road around it with lots of curves and a low speed limit. 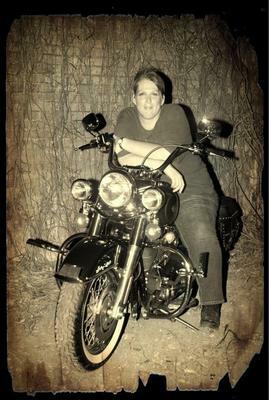 In no time I was riding all over the back roads following my hubby around like a lost little puppy dog. And enjoying the heck out of it. We both took a Rider's Edge class. And even though he had been riding since he was a kid, my husband said he learned alot of new thing too. We now ride all over the place together. It is sometimes just an adult evening ride, other times it is a family ride when we load up our son and daughter. And we always enjoy the group rides. 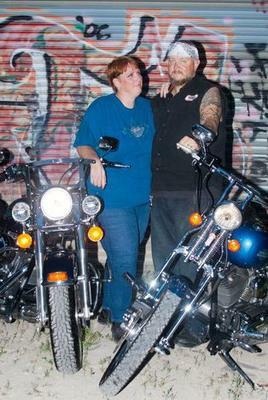 I love riding my own, and enjoy riding with other women and couples that enjoy riding as much as we do. Awesome I'm right there with you on my 2012 Iron 883!!! Beautiful bike, great story! Thanks for sharing!